Zuccarelli's Italian Kitchen. A Family Tradition Since 1981. 1937 N.
eat on Okeechobee in West Palm?" response. And I am glad I went. Zuccarelli's reminded me of home (NY). It was a lovely dining room, with family friendly service, just as advertised! The only problem was that I always like a pizza counter. I find it awkward to wait to be seated and be presented with a menu, just to order a slice & a coke. But the service was very pleasant and I didn't mind here. While I was waiting a small altercation erupted between the customers. Apparently a man at the bar sneezed too often in the opinion of one of the diners. "That's three times, go outside, I am trying to eat." It almost erupted in a brawl, as all the customers were defending the sneezer. It was just a sneeze after all. It was not like he was having a fit. Anyway, management was quick to calm everyone down. I like this story but it in NO WAY reflects anything bad about Zuccarelli's. I think it just added to my feeling that I was back north. And when I tasted my slice I was once again transported. It was delicious. The type of place you find on every street in NY. It wasn't 7 or 8 out of 8; after all those are the places you go out of your way to get to. I always thought it was weird when I passed 3 or 4 pizza places on the way to my regular spots. When I passed 7 competing pizzeria's I knew I was going to someplace special (Denino's in Staten Island, Arturo's in The Village, Taconnelli's in Philadelphia). Those get the 7 out of 8, and 8 out of 8 rankings. 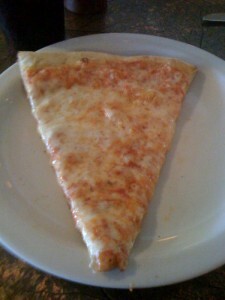 Zuccarelli's get's 6 out of 8 slices on the pizza scale. If you are in West Palm Beach and want to get the best pizza in the area I HIGHLY recommend Zuccarelli's. As an aside, the next day I was in Palm Beach Gardens. When I called the Worst Pizza office for a recommendation, again I received the response Zuccarelli's. Now as good as it was, I wasn't going to drive all the way there, but apparently there is another restaurant using the name. I went over to check it out, and it was the same owners. A very lovely restaurant in the spot that used to occupy "On The Vine." With a separate Pizzeria opening up next door. I can hardly wait!